Crew members’ bodies change in a variety of ways during space flight, and some experience impaired vision. 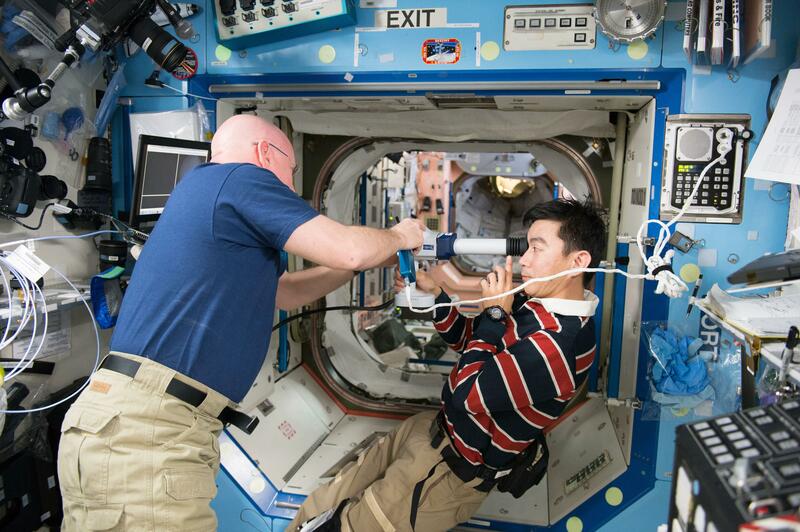 The Prospective Observational Study of Ocular Health in ISS Crews (Ocular Health) protocol gathers data on crew members’ visual health during and after long-duration space station missions. 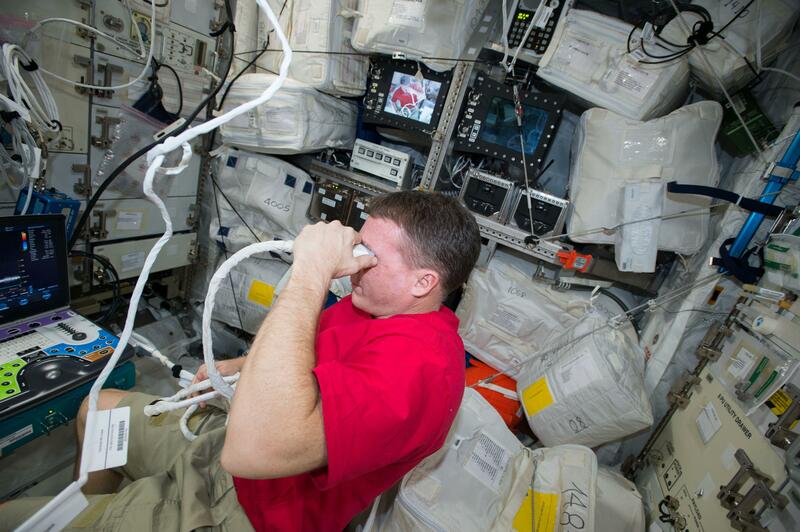 Tests monitor microgravity-induced visual impairment, as well as changes believed to arise from elevated intracranial pressure, to characterize how living in microgravity can affect the visual, vascular and central nervous systems. The investigation also measures how long it takes for crew members to return to normal after they return to Earth. The following content was provided by Christian Otto, and is maintained in a database by the ISS Program Science Office. The purpose of this study is to collect evidence to characterize the risk and define the visual changes, vascular changes, and central nervous system (CNS) changes, including intracranial pressure, observed during long-duration exposure to microgravity, including postflight time course for recovery to baseline. This study gathers information that can be used to assess the risk of Microgravity-Induced Visual Impairment/Intracranial Pressure (VIIP) and guide future research needs. 1. It is expected that some crew members may experience meaningful and detectable in-flight changes in at least one or more of the following: clarity of vision (visual acuity), pressure inside the eyeball (intraocular pressure), swelling of the optic disc (optic disc edema or papilledema), folds in the vascular layer of the eye (choroidal folds), optic nerve sheath distention, elongation of the optic nerve resulting from an increase in cerebrospinal fluid or CSF (optic nerve tortuosity), optic nerve-to-sheath ratio, flattening of the back part of the eye (globe flattening), and retinal “cotton-wool spots” (retinal nerve cells damaged by lack of blood flow), cardiovascular and cerebrovascular compliance and intracranial pressure. 2. It is expected that some crew members may experience meaningful pre- to postflight changes in one or more of the following: visual acuity, intraocular pressure, optic disc edema (papilledema), retinal nerve fiber layer, choroidal folds, optic nerve sheath distention, optic nerve tortuosity, globe flattening, retinal “cotton-wool spots”, smaller changes in blood volume relative to increases in blood pressure (vascular compliance), intracranial pressure, increased CSF production, signs of elevated CSF pressure (pituitary concavity), and areas of constriction within veins of the brain. 3. It is expected that if an in-flight or postflight measure deviates from preflight baseline measures, the time required to recover to baseline (preflight values) increases with the severity of the deviation. –Visual Acuity: Near and far visual acuity is tested for each eye independently with and without a corrective lens using an eye chart. The crew member is asked to stand 16 inches from the chart for the near-visual acuity test and 10 feet from the computer for the far-visual acuity test, using Acuity Pro software. –Amsler Grid: Amsler grid testing is a measure of intact vision. It is used to assess visual changes in the central portion of the retina (the back of the eye). Amsler grid testing is performed on both the right and left eye. The crew member is asked to sit 16 inches from the grid and focus on the dot in the center of the grid while slowly bringing the grid toward the uncovered eye until one of the red ovals disappears. Any changes to the appearance of the grid (wavy, blurred or missing lines) indicate a positive for this test. Intraocular Pressure and Blood Pressure: Intraocular pressure (IOP) is the fluid pressure of the aqueous humor inside the anterior chamber of the eye. Tonometry is performed on the right and left eye using a commercial tonometer. In preparation for the measurement, 2 drops of Proparacaine, an anesthetic, are administered in each eye. The operator stabilizes the subject’s head and gently taps the tonometer tip to the clear surface of the open eye, directly over the pupil, to obtain the measurement. At least one operator per increment must be trained to collect data. Prior to data collection, the operator practices on the “eye simulator” to establish operator precision and accuracy. Tonometry cannot be effectively performed on oneself using the Tono-pen® tonometer; therefore, if the operator also participates as a subject, a second operator must be trained. Immediately prior to tonometry, a blood pressure measurement is obtained after 5 minutes of rest. After completing tonometry, an 8-hour rest is required prior to performing any other ocular test (overnight preferred). Ocular Ultrasound: Ocular ultrasound is used to identify changes in globe morphology, including flattening of the posterior globe, and document optic nerve sheath diameter (ONSD), optic nerve sheath tortuosity, globe axial measurements, and choroidal engorgement. Subjects are seated (pre and postflight), or restrained (in-flight), during testing. A sonographer or trained crew member positions the ultrasound probe with water over the closed eyelid, and collects the ultrasound images. In-flight data collection is assisted by remote guidance to ensure proper positioning and data collection. Fundoscopy: Direct fundoscopy is performed on the right and left eye to obtain images of the retinal surface. Subjects receive this exam as part of their preflight, in-flight, and postflight ophthalmological assessment. Since dilation is required for fundoscopy testing, sessions are scheduled around in-flight piloting, EVA and docking activities. All in-flight exams are remotely guided. Still images and short cine clips are recorded. Up to four additional examinations may be conducted postflight if abnormalities of the fundus persist. Optical Coherence Tomography and A-Scan (Note that A-Scan is also referred to as Optical Biometry and is only performed in pre- and post-flight testing): Optical coherence tomography (OCT) is a diagnostic imaging technique that is based on analysis of the reflection of low coherence radiation from the tissue under examination. It involves measurements of retinal thickness, volume, and retinal nerve fiber layer (RNFL) thickness using a method of quantitative cross sectional analysis. The OCT software is able to identify and “trace” two key layers of the retina, the nerve fiber layer and the retinal pigment epithelium. OCT is conducted preflight, in-flight, and postflight to detect subtle changes in the RNFL of the optic nerve head. The OCT scans are performed with the subject placing his or her chin on a chin rest, while the device performs a scan of the eyes. Vascular Compliance: Vascular compliance is calculated by dividing a subjects stroke volume derived from echocardiographic measurement, by their pulse pressure (the difference between systolic and diastolic blood pressure measured at the brachial artery). Pre- and post-flight measurements are made in both the supine and seated position, each preceded by 5 minutes of rest. Transcranial Doppler (TCD): Pre and post-flight testing will take place following the vascular compliance (cardiac ultrasound) session. During this test, expired CO2 will be measured via a nasal prong. Continuous blood pressure will be monitored throughout the TCD session using a Finapress finger-tip monitor. The subject will be secured to a tilt table while lying supine (horizontally on the back). After five minutes of quiet rest, TCD recordings will be acquired for five minutes in each of four experimental positions, 90° (standing), 0° (supine), 15° Head Down Tilt (HDT), and 25° HDT. After each experimental condition, the subject will be returned to the baseline horizontal position for 5 minutes prior to the next experimental condition. In-flight testing will be the same, except that the TCD recording will be made in only one position and will not include continual CO2 and blood pressure monitoring. Contrast Sensitivity: This test checks for the ability to differentiate between light and dark (contrast) and is an important measure of visual function. Like a standard visual acuity chart, a contrast sensitivity chart consists of horizontal lines of capital letters. However, instead of the letters getting smaller on each successive line, the contrast of the letters (relative to the chart background) decreases with each line. Refraction Testing: Refraction is a procedure used to measure the refractive status of the eyes (i.e., to obtain a prescription for eyeglasses). This is accomplished by having the subject look through a phoropter and focus on an eye chart 20 feet away (manifest refraction). A more accurate measure of refractive error, called cycloplegic refraction, is obtained by administering eye drops to the subject to temporarily relax the focusing muscles of the eyes. Threshold Visual Field Testing: This is an eye examination that can detect dysfunction in the central and peripheral vision. The subject is asked to look at a central spot on a screen (e.g., laptop computer) and to press a button or click a mouse each time a “light flicker” appears or a line on the screen is seen to move. Pupil Reflexes: This test assesses the reaction of pupil size in response to light which is a test of the integrity of the neurological functions of the eye. The test operator will shine a bright light (e.g., penlight) in front of the subject’s eye and watch for the pupil reaction. Extraocular Muscle Balance: A moving target (e.g., pen) is used to track eye movements for assessing extraocular muscle function and integrity. Magnetic Resonance Imaging (MRI): Pre and postflight magnetic resonance imaging (MRI) will be performed on all ISS crew. Several key parameters indicative of elevated intracranial pressure and its effects on ocular structures are measured during MRI scanning. Some of these measurements are similar to those obtained during on-orbit ultrasound which allow for comparison. Globe flattening, ONSD, ON tortuosity, optic nerve-to-sheath ratio, increased CSF production, signs of elevated CSF pressure (pituitary concavity), and areas of constriction within the veins of the brain are assessed with MRI. Slit Lamp Biomicroscopy and High Resolution Retinal Photography: Slit lamp biomicroscopy and high resolution retinal photography are performed to evaluate and document any changes in eye structures. 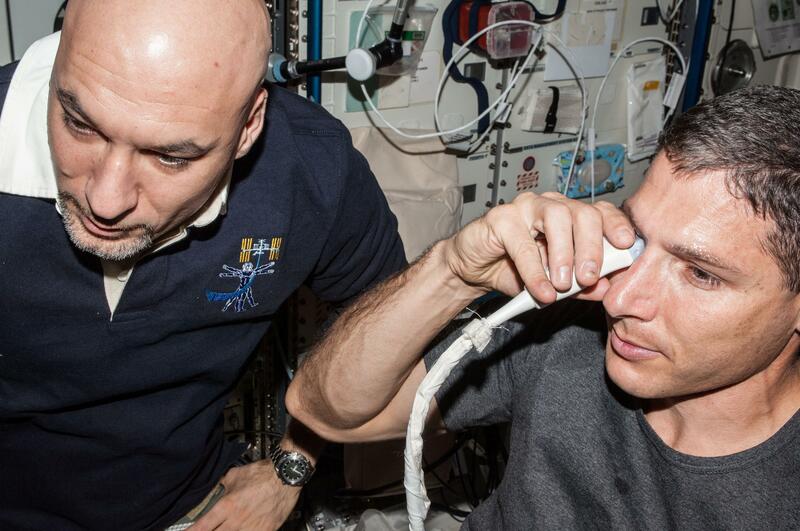 Results from Ocular Health address several gaps in current knowledge, including physical and functional changes in the eyes during and after spaceflight. Systematic measurements of the visual, vascular, and central nervous system can inform future research, and develop countermeasures to safeguard crew members’ vision. In addition, results can demonstrate the potential risk for crews on long-duration space missions. If microgravity is entirely or partially responsible for changes to the visual system, crews operating on missions five times longer than current space station expeditions may be negatively impacted. Ocular Health provides insight into structural changes that can occur in the eyes and nervous system, which could be relevant for patients suffering from a wide range of ocular diseases, such as glaucoma. It also provides data that could be used to help patients suffering from brain diseases, such as hydrocephalus and high blood pressure in the brain. A total of 12 subjects are required for this investigation. In-flight sessions are planned at FD10, FD30, FD60, FD90, FD120, and R-30 for a mission duration of six months and FD10, 30, 90, 150, 210, 270, and R-30 for a mission duration of one year. Tolerance for each test session is +7 days, with at least 14 days between the last test of one FD session and the first test of the next FD session. All activities associated with the session required on a given FD may occur within a 5 day window. Both an operator and a subject are required for the ultrasound scans, fundoscopy, tonometry, OCT, and blood pressure, along with real-time video downlink to enable remote guidance by ground experts. In-flight measures are taken on Flight Days 10, 30, 60, 90, and 120, as well as 30 days prior to return for a mission duration of six months, and on FD10, 30, 90, 150, 210, 270, and R-30 for a mission duration of one year. At each session the following tests are performed: questionnaire, fundoscopy, OCT, visual acuity, Amsler grid, tonometry with blood pressure, ocular ultrasound, cardiac ultrasound, and transcranial Doppler imaging with blood pressure measurement. At Flight day 30 and 90 as well as 30 days prior to return, the questionnaire, ocular ultrasound, fundoscopy, OCT, visual acuity, and Amsler grid measurements are obtained via data sharing with medical operations. The same measures;are obtained via data sharing on Flight day 90, 150, 210, and 270 for year-long mission crew members. Kramer LA, Hasan KM, Sargsyan AE, Wolinsky JS, Hamilton DR, Riascos-Castaneda R, Carson WK, Heimbigner J, Patel VS, Romo S, Otto C. Mr-derived cerebral spinal fluid hydrodynamics as a marker and a risk factor for intracranial hypertension in astronauts exposed to microgravity. Journal of Magnetic Resonance Imaging. 2015; eoub. DOI: 10.1002/jmri.24923. PMID: 25920095. Marshall-Bowman K, Barratt MR, Gibson CR. Ophthalmic Changes and Increased Intracranial Pressure Associated with Long Duration Spaceflight: An Emerging Understanding. Acta Astronautica. 2013 June-July; 87: 77-87. DOI: 10.1016/j.actaastro.2013.01.014. Otto C, Barr YR, Platts SH, Ploutz-Snyder RJ, Sargsyan AE, Alexander D, Riascos-Castaneda R, Gibson CR, Patel N. Prospective observational study of ocular health in ISS crews-The Ocular Health Study. 2015 NASA Human Research Program Investigator’s Workshop, Galveston TX ; 2015 January 13 1 pp. Michael AP, Marshall-Bowman K. Spaceflight-induced intracranial hypertension. Aerospace Medicine and Human Performance. 2015 June; 86(6): 557-562. DOI: 10.3357/AMHP.4284.2015. NASA Image: ISS042e033950 – NASA astronaut Terry Virts performs an Ocular Ultrasound self-scan to obtain images of the optic nerve and globe of the eye. 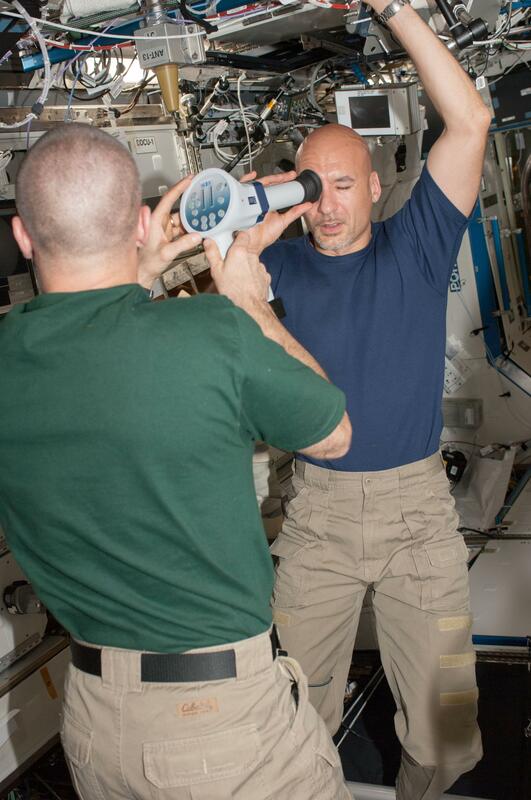 NASA Image: ISS042e030650 – NASA astronaut Barry Wilmore conducts a Tonometry exam on NASA astronaut Terry Virts. Tonometry measures the intra-ocular pressure of the subject. Cosmonauts Gennady Padalka and Mikhail Kornienko perform Optical Coherence Tomography (OCT) on ISS to capture images of the retinal layers of the eye (Picture courtesy of NASA). 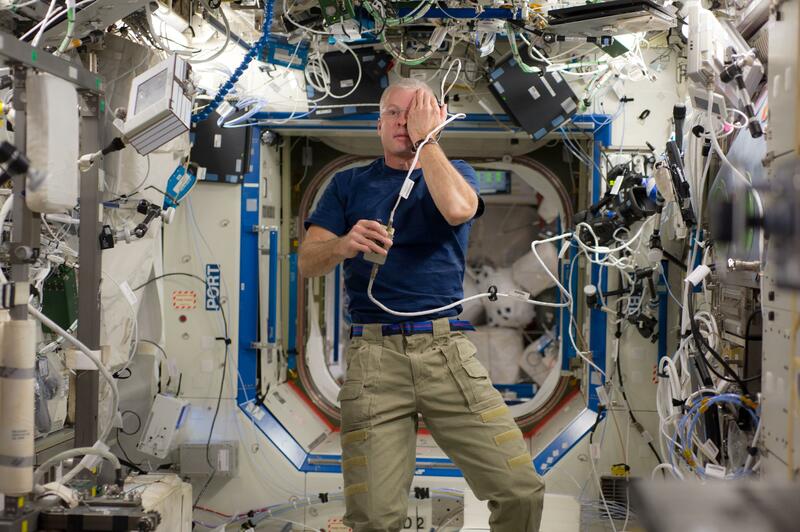 NASA Image: ISS040e006106 – NASA astronaut Steve Swanson covers his left eye while performing Visual Acuity and Amsler Grid testing with his right eye using the Acuity Pro software. NASA Image: ISS038e011807 – JAXA astronaut Koichi Wakata sits in the chin rest during an Optical Coherence Tomography (OCT) session on ISS. 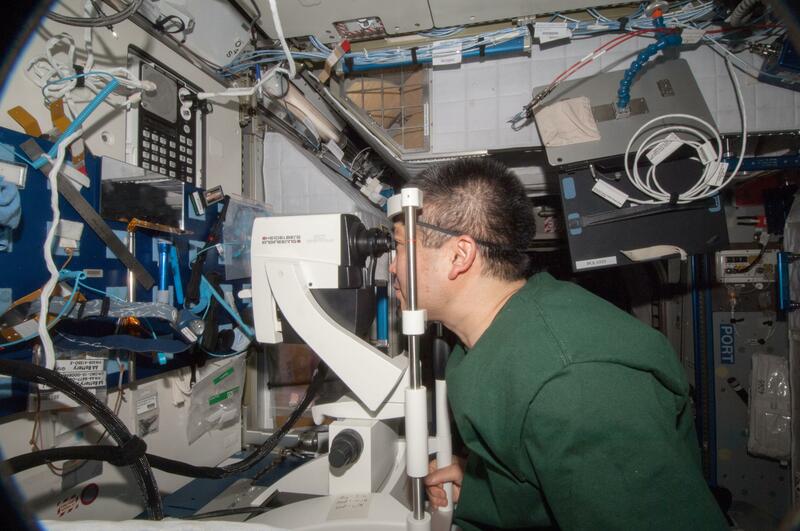 NASA Image: ISS036e006432 – Luca Parmitano collects Fundoscope images of the back of the eye with the assistance of Chris Cassidy for the Ocular Health experiment. 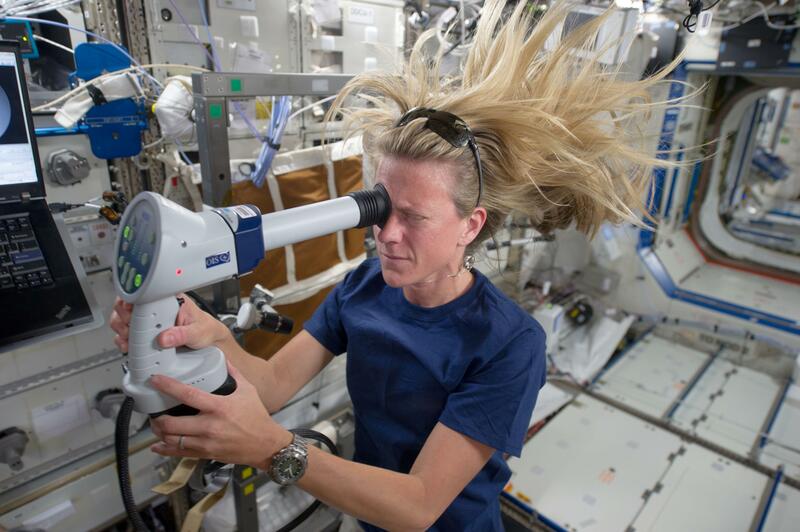 NASA Image: ISS036E006522 – Astronaut Karen Nyberg performs an Ocular Health (OH) Fundoscope Exam. NASA Image: ISS037E006560 – NASA astronaut Michael Hopkins Eflight engineer, performs ultrasound eye imaging in the Columbus laboratory of the International Space Station. 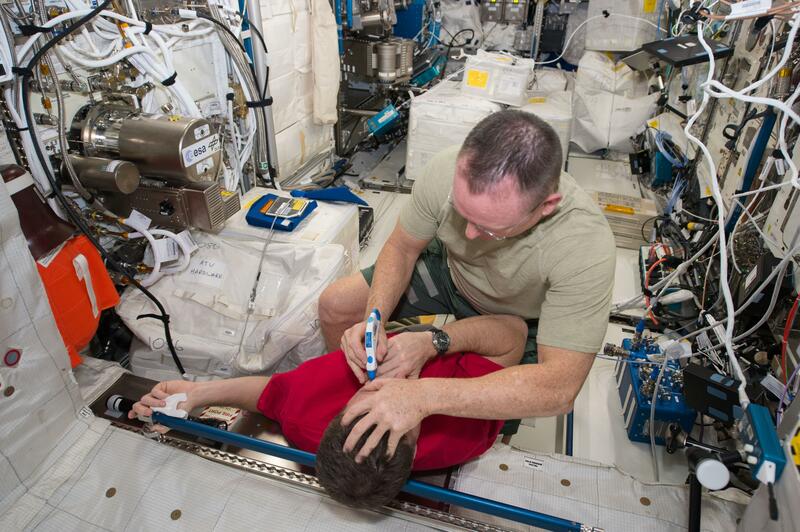 NASA Image: ISS044E033346 – View of NASA astronaut Scott Kelly with JAXA Kimiya Yui during Fundoscopy Exam. The students in Long Beach, California are working on the “Occupy Mars Learning Adventures.” They are going to Jr. Medical School. They will one day be the surgeons that will help astronauts from a distance. We are working with prototypes of robotic arms and controlling them from a distance. 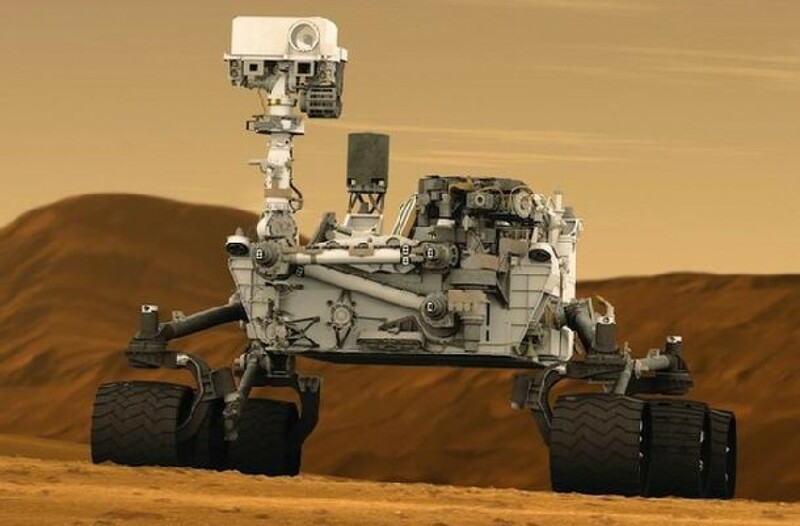 Learn more about the Barboza Space Center at the following websites. DISCLAIMER: Surgical imagery depicted. Not for the easily squeamish! // Medical technology is getting weirder everyday — in a good way. Robotic surgery and computer-assisted medicine are already doing amazing things right now — just look at the da Vinci Surgical System! Are you ready to ditch the hospital and buy a robot surgeon for the home? Let’s say you have to have a dangerous surgical procedure. Which would you choose? The best human surgeon alive today, or the best robot surgeon from 50 years in the future? Let us know your decision and why in the comments below! Our students studying at Jr. Medical School are studying to become robot surgeons.